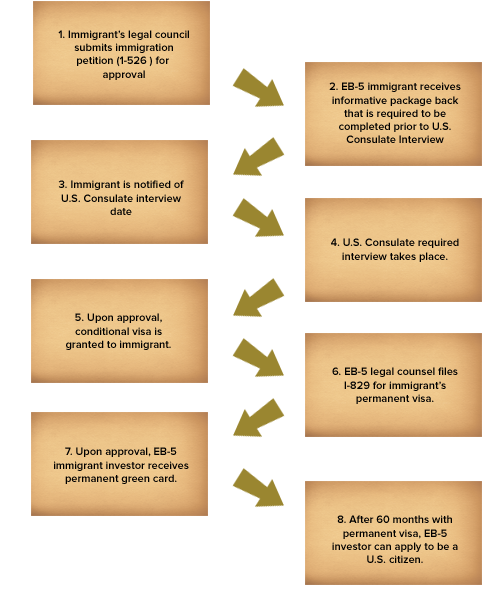 Before the Immigration Process can begin, prospective EB-5 immigrants must choose one of the three EB-5 immigration options. Usually immigration consulting companies can help with the selection process. Immigrants must register for a project or Regional Center of his or her choosing and qualify as an accredited investor. An accredited investor is an individual who has a net worth of a minimum of $1,000,000 or has made $200,000 each year for the last 2 years. The immigrant’s attorney prepares and files the I-526 petition with the USCIS. The current approval process of a I-526 takes the USCIS about 13-15 months. The investor must sign the subscription agreement and other requested documents. The investor deposits $500,000 U.S. in a secure escrow account and pays a subscription/administrative fee to the project or Regional Center. If the I-526 is approved, the $500,000 in the secure escrow account is unconditionally released and invested in the real estate project. If the application is denied by USCIS, the full $500,000 investment is promptly refunded to the investor from the secure escrow account. After approval, the EB-5 investor must interview at their local U.S. Consulate or Embassy. The purpose of this process is to ensure that the investor and his or her family undergo medical, security and immigration history checks before the conditional visas are issued. The investor and family members then enter the United States and receive conditional visa/green cards. After two years, the immigrant’s attorney files an I-829 petition to make the investor’s visa/green card permanent, rather than conditional. The project or Regional Center will assist the investor and his or her attorney in the preparation of the application. The I-829 must be filed between the 21st and 24 month after U.S. entry. Upon approval of the I-829 petition, the immigrant investor will be issued a new unconditional green card and be deemed a permanent resident and may permanently live and work in the U.S.
After 5 years of issuance of the conditional green card and maintaining full investment in project or Regional Center the immigrant and family may apply for U.S. citizenship.